It is long time since I wrote the last article for Termoionica Applicata. In the meanwhile I have spent a lot of time with very different projects, all solid state, for example the Solidphono, the Convertus and, yet unpublished, a new version of this last, a phono pre-amp and a line pre-amp, plus the test of different devices, included a low jitter clock. This does not mean that the tube design are necessarily inferior to solid state ones, exactly as the tube solution I previously adopted does not mean the opposite. As a matter of fact I have just been looking at different solutions to obtain the same result: I just wanted a really good pre-amplifier, not too complex and expensive. Nothing esoteric, especially in the price. It is anyway true that in the last years my priorities for the sound of a system has changed smoothly but continuously and I would say that now my ideal sound is drastically different from what I liked a few years ago. In the meanwhile the original MW Pre 01 has gone through some changes that modified its sound according to my new ideas. This article summarizes these changes. PLEASE TAKE INTO ACCOUNT THAT BUILDING THIS OBJECT IS NOT SAFE AND QUIET AS ANY LOW VOLTAGE KIT: YOU WILL BE FACING A FEW HUNDREDS VOLT INSIDE THE AUDIO CIRCUIT: NO AREA OF THE CIRCUIT IS SAFE. SOME COMPONENTS ARE POTENTIALLY DANGEROUS EVEN USED AT LOW VOLTAGES. IN THIS APPLICATION THEY CAN BECOME DEATHLY DANGEROUS: THEY CAN CAUSE INJURIES AND ALSO DEATH IF INPROPERLY HANDLES AND USED. THIS PROJECT IS NOT FOR BEGINNERS. IF YOU HAVE NEVER BUILT YOURSELF A TUBE CIRCUIT, YOU'D BETTER BEGIN WITH SOMETHING FAR SIMPLER AND WITH A FAR MORE DETAILED INTRODUCTION AND DESCRIPTION. IF YOU HAVE NEVER BUILT AN ELECTRONIC CIRCUIT YOURSELF, THAN TAKE INTO ACCOUNT THAT IN ORDER TO PROPERLY HANDLE THE FOLLOWING INSTRUCTION THE BUILDER IS SUPPOSED TO HAVE A FAIRLY GOOD KNOWLEDGE OF ELECTRONIC DIY. NOTE THAT QUITE A LOT OF PIECES OF INFORMATION ARE MISSING FOR IT TO BE OF ANY USE FOR A BEGINNER. I TOO, AS MY FRIEND THORSTEN, WOULD NEVER SUGGEST ANY TUBE DESIGN FOR A BEGINNER; BUT I WOULD NEVER SUGGEST THIS PROJECT FOR ANY FIRST-TIMER, AS TO SET IT UP CORRECTLY, AVOIDING ALL NOISE AND GROUND LOOP PROBLEMS, IS NOT AS EASY AS IT CAN APPEAR. THERE IS REALLY A SERIOUS DANGER IN ANY TUBE DIY PROJECT: THE REQUIRED DC VOLTAGES ARE REALLY VERY DANGEROUS, AND CAN REALLY BE LETHAL. IF YOU THINK I AM JOKING, PLEASE HAVE A LOOK TO Workbench Safety di Doc Bottlehead. IN ANY CASE HAVE A LOOK TO THE GENERAL DISCLAIMER. NOTE: I REPEAT THE IMPORTANT WARNING HEREABOVE BECAUSE THE MISUSE OF SOME OF THE COMPONENTS LISTED BELOW CAN CAUSE REAL HAZARD TO YOUR LIFE. I AM NOT JOKING AT ALL: LONG TIME AGO I SAW A FAR SMALLER ELECTROLITIC CAPACITOR EXPLODING, AND I THINK THAT THE EXPLOSION OF THE HUGE ONE PRESENT IN THE CIRCUIT BELOW CAN REALLY BE EXTREMELY DANGEROUS. The changes to original design requirements were the following ones. The pre-amp must be even less noisy then the original version (even though even in the original version noise already did not cause any practical problem). The phono stage is no longer required - as the Solidphono is better (IMHO) then the Simpre phono stage, and definitely has no "solid state" imprinting (ok, this too is also an obliged solution due to the lack of room) . The overall cost can go higher than the original design, as far as the greater expense is fully compensated by a better sound. Obviously, if you think RIAA is mandatory, then you can just implement it as it was in the 01 version. But the lack of room in the box could partially compromise the result. The MW Pre 01 was designed as a pre with phono stage. The overall design was based on this. In particular the phono stage design, using two ECC88 with unbypassed cathode had a low gain, insufficient to make the output level of the phono stage comparable with a normal line input level. 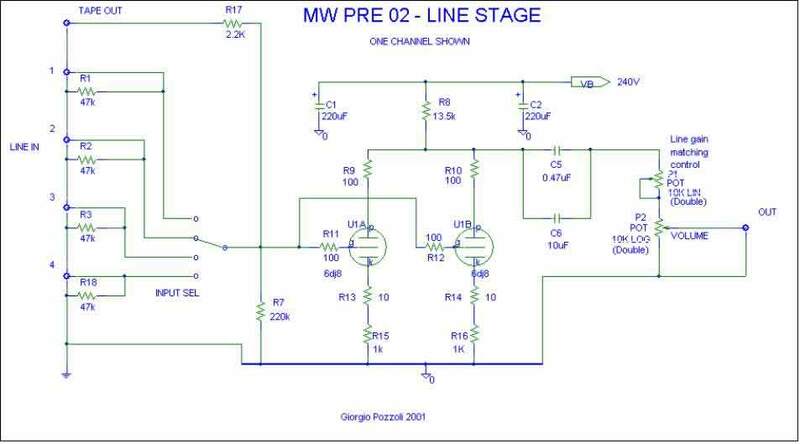 This was solved by increasing the gain of the line stage making it much higher than necessary for a typical line stage and reducing the sensitivity of the line inputs of the pre by passive dividers. The disposal of the phono stage obviously now allows to modify this situation, eliminating the input dividers and decreasing the line stage gain. The major problem that I found during advanced (instrumental) testing of the old version was, rather unexpectedly, the PSU 50Hz noise. The direct cause of such noise was obscure, as any estimate of the PSU filter attenuation capability said that it was out of discusssion. The effect was instrumentally relevant in the phono stage, while it caused no apparent problem in the line stage, even though it could be measured. After a lot of testing, the noise proved to be magnetic noise irradiated from the transformer apparently directly on the medium impedance input selection circuits. 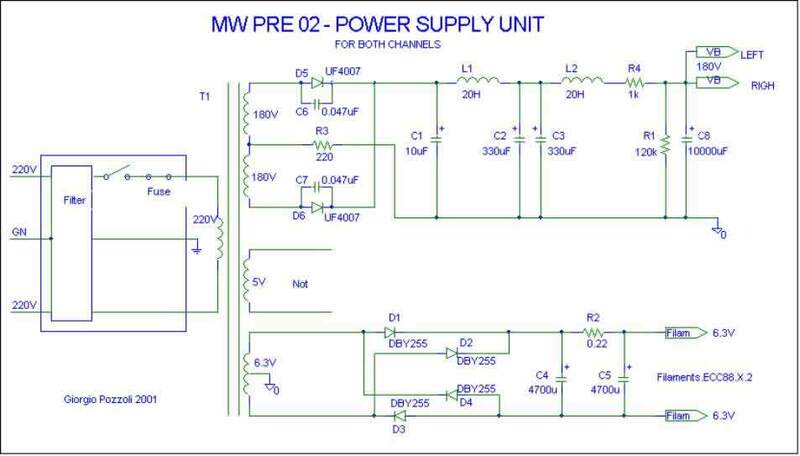 Hence rearrange the layout of the functional blocks so that the audio circuits are as far as possible from the transformer, and use a very good transformer with very low leaked flow. Note that I tried using a normal shield (a copper foil connected to ground) to eliminate the noise, but this had no effect at all; some filtering effect was instead obtained by using a 1 cm thick shield made of several layers of sheet for magnetic cores. The HT PSU has been completely redesigned. I had noticed that the introduction of the tube rectifier in the PSU modified heavily the sound making it much sweeter and terribly alluring, to such an extent that at the time the sound appeared to me simply witchcraft (the name, MW, derives in facts from Marble Witch). As time passed by, anyway, I started realizing that the sweet and alluring sound was obtained at an high cost, trading in for it speed and impact. In the meanwhile I had started again designing solid state components, where I normally use, give the reduced costs, very high value reservoir capacitors anywhere a simple low value bypass capacitor should in theory solve the problem, and when I realized the problem above the solution was immediately clear to me. The idea is simply this: currents in a solid state and in a non-transformer coupled tube pre-amplifier are definitely similar (this is not true in a in transformer coupled power amp and pre-amp, as the output transformer allows to trade in extra voltage swing for current). Then there is no good (technical) reason for which a high value capacitor is considered necessary in solid state, but not necessary in non-transformer coupled pre-amps. This means that even in a pre-amp like the MW Pre you should use capacitors of thousands of microfarads; and the list price of such components immediately explains why they are not considered necessary: just to avoid doubling the cost of the product!!! This was my idea, but I did not find any example of units using this kind of approach. Later, when I had already decided to redesign the PSU including very high value capacitors and was thinking about a regulated one, I had a look to Thorsten Loesch's Toccata pre-amp, which I knew since the original MW pre 01 time, and I discovered that he used two 10000uF caps. I really do not know if my idea was facilitated by the forgotten study of the Toccata, it might well be. Anyway the resulting PSU remains rather different. The transformer and most of the components have remained the same of the 01 version. The rectifying tube instead has been substituted with two solid state UF4007 diodes, similar to 1N4007 but ultrafast recovery (50nsec), which helps reducing the commutation pulse noise to a minimum; for the same reason each diode has a 0.047uF capacitor in parallel. The filter is a double LC pi filter, quite similar to the 01 version one. A couple of resistors (R3 and R4) are used to filter out disturbs and control the PSU output voltage. The components are mostly the same as in MW Pre 01. The first one remains the same small one, in order to reduce the peak current required to load it and utterly reduce commutation noise. The following ones are two 330uF in parallel, far larger, but not yet enormous. Anyway a 10000uF 250V (very expensive, alas..) capacitor with another 0.33uF paper in oil capacitor in parallel has been added as the last pi filter element just before the HT connection splits for the two channels, and as near as possible to the line stages. This should help cleaning up high and low frequencies and making these last more solid and with greater impact. Obviously a 10000uF+0.33uF capacitor couple for each channel would have been better, but the one I used costed about 130USD. It's up to you to use one or two. If you choose to use two, than you should better go for the best solution and split even the last pi filter using a separate inductor and capacitor couple for each channel. The input selector has been competely rebuilt using the same components (only one more 47K resistor is needed). All the input and output RCA connectors are placed in a two line array, the upper for the left channel and the lower for the right; they are all insulated from the cabinet. The cold (ground) side of the eight input connectors and of the tape out ones are connected together by a silver plated copper wire with a diameter of 1.2mm. The ground reference resistors, used to prevent the input connectors to float freely, are directly soldered from the input connector hot side to the wire, which is also connected in one point to the cabinet. The input connector hot side is also connected through short length of solid core copper wire (I am currently using the internal wires of UTP Cat.5 network cable, but wirewrap wire would be even better) to the input selector. The selector output pins are connected to the tape out connector directly through the 2.2k resistors and to the line stage using the necessary length of solid core twisted pair (alwais from the UTP cable), with the second wire connected to the input ground bar on one side and to the line ground on the other. Note that the output connectors ground side is not connected to the ground bar. Line amplifier is exactly the same as MW Pre 01, apart a few details. The resulting sound is, anyway, quite different. The cathode resistor bypass electrolytic capacitors have been eliminated. This reduces drastically the pre-amp gain (from 11.5 to 6.1) and distortion (from 0.67% to 0.27% for 2V peak output; all numerical data obtained using simulations). The output coupling capacitor, originally a paper in oil 0.47uF capacitor, has been reinforced by adding a 10uF polypropilene capacitor in parallel. This in theory extends the frequency responce to ultra low frequencies (if you suppose to have a power amp with a 47Kohm, from about 15Hz down to 0.33Hz with the volume control at -6dB), but as a matter of fact even with my loudspeakers, very fast and tight but rather stingy in the low department, the difference can be fully appreciated. I substituted the Mullard ECC88 tubes I had in use for something far less famous and less warm, but more fast, brilliant and tight. Currently I am using in their place the Philips ECG 6922 I originally used in the phono stage. The only design change is the reduction of the value of both potentiometers from 47k to 10k ohms, in order to offer a far lower output resistance. Obviously one remains a linear type, while the other is a logaritmic type. Potentiometer, as said in the original article, are all carbon low cost ones. A few years ago I decided, in an attempt to protect low cost potentiometer from powder and similar amenities, to try making them hermetic, and started completely covering them with Teflon mummy tape. Apart the fact that now they seem big cocoons, or else mummies of potentiomer, up to now no one of the so treated potentiometers have shown any sign of age, so that I can really say that it has proved a good idea. The line stage output of each channel is connected separately through a twisted pair (ground + hot side) always from the UTP cable) to the gain controls. For each channel, the hot side is connected directly to the input pin of the gain matching control, while the cold one is connected to the volume ground pin and from this, twisted together with the signal wire from the volume potentiometer output pin, to the ouput RCA connector; the gain matching control output pin is connected to the volume potentiometer input pin with another short length of wire. Note that the output connections for the two channels are completely separate and that their ground wires have no interconnection. As you can see, the changes are important ones for the character of the sound; anyway the pre-amp has not lost anything in transparency and natural balance. The sound is for sure more tight and adherent to the recorded message, without any kind of interpretation or added effect that in some way affected the 01 version. In my opinion this is a long step forward in comparison with the previous version, but I am also pretty sure that someone especially attracted by the delicate touch of the previous version could still prefer it. From the point of view of cost, I tried to maintain it a low as possible by reusing almost all previous version components. Unfortunately the (really few) added compoonents are rather expensive, so that you can expect to spend about 160USD for them, unless you are able to find them as surplus components. The overall component cost should be around 350USD.